Thanks to the recommendation of Ruru, I finally joined the pod people…coffee pods, that is. I’m a big coffee drinker already, and I’ve tried just about every other method of coffee making–the french press, the Cuisinart Grind and Brew, Mr. Coffee and his clones, the paper cones, even the coffee sock and the percolator and the stovetop espresso maker. But nothing came close in quality to what I get from the pod machine, and the speed and convenience is just literally unreal. I’m astounded that this has been around for so long without my knowledge! 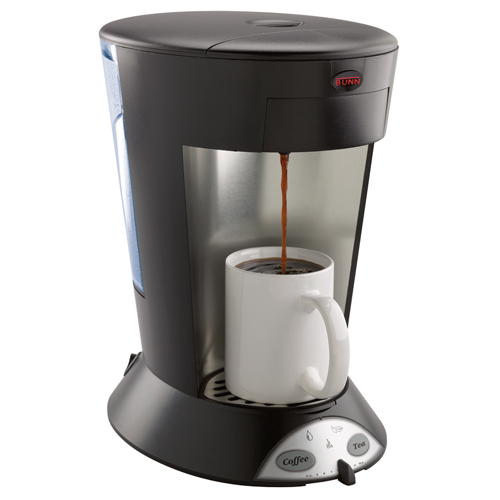 I did a lot of research before coming to a decision, looking at the market-dominating Senseo, the proprietary, non-compatible pod design of the Keurig, and the universally-despised Black and Decker. Single Serve Coffee.com was invaluable in this research, and it led me to what I think is the ideal solution (although expensive and with a pretty dumb name), the Bunn My Cafe. This thing, coupled with some good pods (I’m currently using Cool Beans Pods), really gives me the best cups of coffee, reliably, I’ve ever had. And the process from conceiving the idea “I feel like a cup of coffee” to taking that first sip takes literally under a minute. It even makes great iced coffee, with just as much convenience and flavor and simplicity, and even better, has BLUE LED’s! I’ve even been tempted to carry my little Bunn with me on vacation. It’s a wonder!